This past Tuesday, May 29th, I moved into housing at Black Rock Forest. I spent an afternoon settling in (a.k.a. got groceries and went swimming), then started field work bright and early the next morning. In my three days of work so far, I’ve already collected leaf samples from 27 different trees, updated my collection system, and planned which species I want to seek out this summer. If you haven’t yet read my introduction post, you might want to look at that first for some context. But now, without any further ado, here’s what I did this week. Students conducting research at Black Rock typically use the Wet Lab, a lab space on the second floor of the park’s Science Center. I’m currently sharing it with two Barnard students (both also rising seniors working on senior thesis projects): Kiran, who is examining the affect of acid rain on Black Rock’s bodies of water, and Ellery, who is studying animal population dynamics by looking at coyote poop. Kiran set up a space for her work when she arrived last week, while Ellery (who kindly gave me a ride up from Barnard on Tuesday) and I both claimed tables on Wednesday morning. For this stage of my research project, the set-up is pretty rudimentary. I primarily need enough table space to cut leaves off of sizable tree branches, enough small envelopes to store those leaves, a drying oven to remove excess water from those leaves, and a box to put them in once this whole process is complete. Luckily for me, Black Rock already has all of these things, although I will need to order more envelopes later in the summer. Once I found some pruning shears and unearthed my old “trees of north America” field guide, I was ready to go. One major difference in my field work this summer compared to last summer is that I’m tracking the coordinates of every tree I sample. (Last summer, I only recorded general locations, which is not particularly useful for anyone who goes out to look for those trees in the future, future Betsy included.) To track these locations, I’m using Avenza Maps, a GIS mapping and cartography app that works well offline. 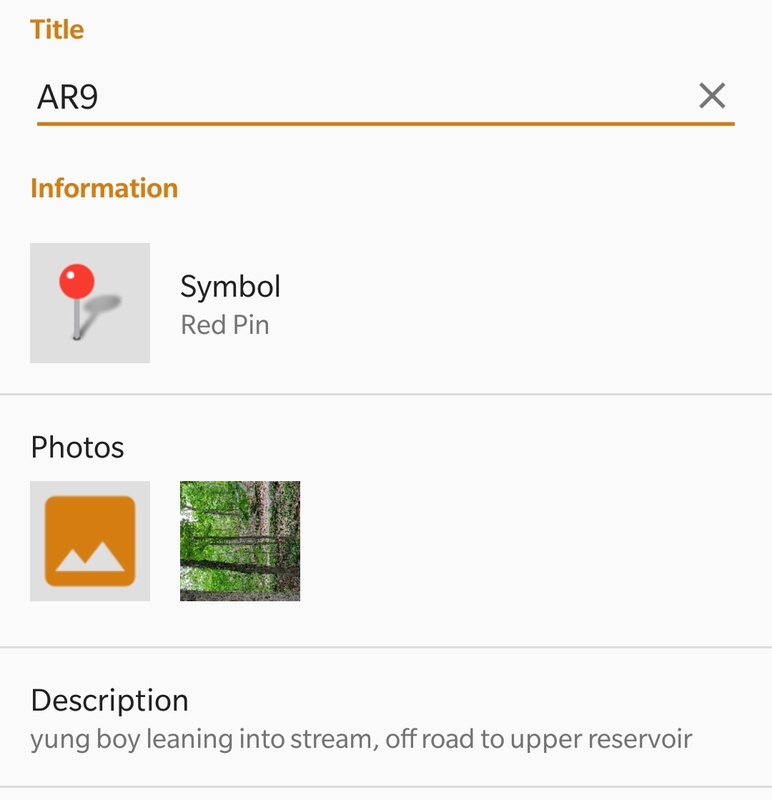 Black Rock staffers have made a map of the forest accessible for Avenza by creating a file that incorporates GPS data with the image. When I go out into the field, I can load this map, turn on location services, and track myself as I travel through the park – even when I have no cell reception (which is common here.) 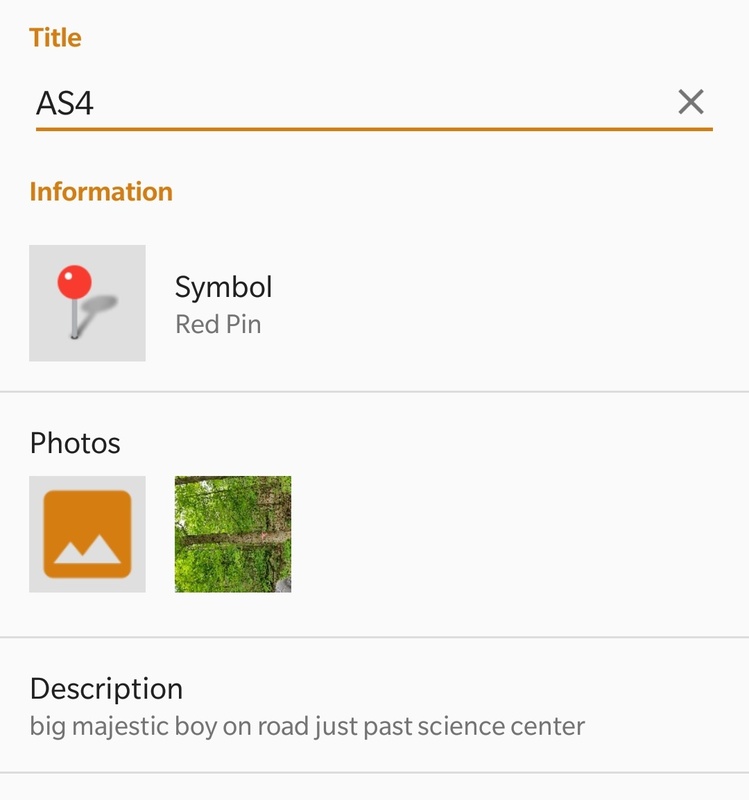 I can also add pins for every tree I sample, including the sample’s ID, location, notes, and a photo. This summer I’m also improving my technique by using a pole saw; as you might guess from the name, it’s basically a saw on a long pole. This tool lets me cut down branches over twice my height off the ground – a bit like a step stool that helps toddlers reach cabinets above their heads in the kitchen (similar balance challenges apply). Black Rock staffers helped me use the pole saw a few times last summer to snip branches from larger oaks, maples, and other tall trees, but this summer, I have borrowed one of the tools for frequent, day-to-day use. It takes practice to wield confidently (as I said, balance challenges), but I’m already getting pretty good at it! I might devote a full post to it in future weeks. Now that I’m moved in at Black Rock, I can take advantage of one of the most valuable resources here: the knowledge of the park’s staff. People such as Director Dr. William Schuster and Forest Manager John Brady have been working in this forest for decades. Between the two of them, as well as other research and forest maintenance staff, I can access a walking, talking encyclopedia on the tree species at Black Rock – albeit a far kinder and friendlier encyclopedia than any print or online options. I talked to Dr. Schuster on Wednesday to get advice on the scientific aspect of my project: I asked him if I should focus more on recollecting species I found last summer or on finding new species. He suggested that I do some of both, then looked at my results from last summer to help me decide which trees I should look for again. This turned out to be mostly those species that showed errors or high variation in my data: the two maple varieties I’d already planned on looking for, a couple of oak species, and several more weedy types. Then, on Thursday, I asked John about which invasive species he’d seen at Black Rock in the past couple of summers and where I could find them. He listed several options, many of which were accompanied with specific directions. Although I took careful notes from both of these conversations, I expect I’ll be going back to John and Dr. Schuster in the next few weeks to ask them more questions. I saved this section for last, because as exciting as setting up and setting goals might be, nothing beats actually going out into the woods and finding some good, good trees. Sampling expeditions let me get lost in the woods – both physically and mentally. As I head off trails and push through brush in search of the specific leaf shapes that mean I’ve found the trees I seek, I can sometimes go hours without encountering another person. It’s a peaceful endeavor, when I’m not frustrated by my inability to find something. As this was my first week, I set myself fairly easy tasks: collect red and sugar maple (which I know how to identify from last summer) from the Stone House region and the road from the Science Center (both locations where I found these species last summer.) Maple is easy to spot because of its distinctive leaf shapes – just picture the Canadian flag, and you know how to pick red maple out of a lineup. Sugar maple is similar to red maple, except more pointed where red maple is jagged. I found 17 of these trees with branches low enough for me to cut on Wednesday and Thursday (11 red maple, 6 sugar maple), allowing me to practice with Avenza and the pole saw. On Friday, I challenged myself more by looking for two species I didn’t include last year: black locust and an invasive willow hybrid. Research Manager Katie Terlizzi helped me find a few examples of both species near Upper Reservoir in the morning; I labeled them, then went back in the afternoon to grab some branches and look for a couple more samples. Although I lost some time bushwhacking (i.e. foraging off trail) in the wrong direction, I ended up with 9 samples total. And I can now identify both trees if I spot them elsewhere around the forest! Not bad for a short week! I’m excited to take the weekend off to do some reading and hiking (on the trails, not off of them), then forge ahead with more collecting next week. Hi, I’m Betsy. Welcome to my tree blog. This summer, I am doing research for my Barnard biology senior thesis in a continuation of a research project upon which I worked last summer. My project involves a survey of biomass construction costs of deciduous trees at Black Rock Forest, an ecology research site and educational center in upstate New York. But what does that mean, exactly? And why am I writing a blog about it? Black Rock Forest is a 1500-hectare privately-owned forest and biological field station in Cornwall, New York. It’s basically located in between the Hudson Highlands and Hudson River Basin, adjacent to Storm King State Park. The forest has been preserved and utilized for research since 1928, when Dr. Ernest G. Stillman consolidated it out of tracts of mountain forest his family had begun purchasing in the late 1800s. Dr. Stillman bequeathed the forest to Harvard, his alma mater, when he died in 1949. Many scientific papers were published using data collected at the site, but Black Rock became threatened in the 1960s by plans to build a power plant on Storm King Mountain. In a pioneering instance of environmental activism, the New York-New Jersey Trail Conference, the Cornwall-on-Hudson Garden Club, the Nature Conservancy, and other groups came together to oppose the plant. Environmentalism won the lawsuit in 1980, and the forest lived on. In 1989, the Forest traded hands to the Black Rock Forest Consortium, a collection of research institutions and public schools that includes both Barnard College specifically and Columbia University as a whole. My research mentor, Columbia ecology professor Kevin Griffin, currently serves as the president of this Consortium. The Consortium supports research projects examining carbon storage, water filtration, ecosystem regulation, responses to climate change, and other aspects of the forest that have broader implications for ecology studies worldwide. It provides subsidized housing and equipment, as well as mentoring, to researchers such as myself while we work on our projects. Between the constant student activity and the long research legacy, Black Rock Forest is an incredibly exciting site for a research project. Data of young scientists such as myself can be compared with similar data from decades of scientists who have come before me. Such legacy is especially important for ecology research, as the lifespan of a typical oak or maple tree far exceeds the lifespan of a typical biologist; through collecting information about the same trees (and ecosystems based around the same trees) for decades, we are continually building a more complete picture of how this forest works. My project is a very small piece of this larger puzzle, and I hope other students can expand upon my work someday. This summer, I will work with Prof. Kevin Griffin of the Columbia University Ecology, Evolution, and Environmental Biology department to survey energy requirements of deciduous trees at Black Rock Forest. My survey will be based upon the construction cost metric, which links energy creation processes (photosynthesis) with physiological traits (biomass construction) and provides a basis for ecologists and plant physiologists to track how resources are partitioned in a temperate forest ecosystem. In this project, I will continue my work with Prof. Griffin from last summer, in which I conducted a preliminary survey and found several possible trends and areas for further investigation. This summer, I’ll work with Kevin Griffin, an expert in plant physiology (and overall incredibly knowledgeable plant biologist). He is guiding me in the collection of leaf samples of a number of broadleaf tree species at Black Rock Forest. I will use all of these samples to calculate the construction cost, a measurement of how much sugar a plant needs to build one gram’s worth of leaf material. My resulting data will help demonstrate how trees at Black Rock use the light, water, and nutrients available to them to grow. I am basing this summer’s work on a similar project I did last summer which was less well organized and didn’t lead to any significant conclusions. In general science terminology, a project like mine is known as a survey. This is the basic, entry level of research into a topic, in which researchers collect a lot of preliminary data without asking very specific questions or performing any experimental manipulation. It’s a bit like sticking your foot into the shallow end of a pool before you go dive in; you need to test the waters before you start drastically changing the environment. Not much research has been done using construction costs recently, and much of it has come from my mentor and his collaborators. That puts me on the forefront of a possible new field, and means that the most useful thing I can do is collect as many samples as possible. That being said, I do have more specific goals that guide me in planning what to collect. Primarily, I hope to find a difference between energy requirements of major species that have dominated at Black Rock for decades (i.e. primarily oaks and maples) and of species that have invaded from other habitats (i.e. tree-sized weeds). The older, established species are well-settled and can grow slowly, devoting more energy to building their mass as they form strong bark, thick sap, and other defenses against animals that might eat them. (Think industry giants working to maintain their status quo and stay ahead of competitors.) Thus, I expect these species to have higher construction costs. Meanwhile, the weedy, invasive species need to grow fast in order to take over new environments, so they use less energy to build the same amount of biomass. (Think startups grasping at any capital they can find.) I expect these species’ construction costs to be lower. Last year, I collected about 130 samples from 15 different species, focusing on this established v. invasive question. My results showed a general trend in line with my expectations, but the differences between my oaks and maples and my weedy trees was not significant enough to be scientifically valid. This almost-but-not-really result was a major motivator for me to continue the project this summer. I plan on collecting more samples from the same species and locations as last summer, while also expanding to new species I couldn’t find or didn’t have time to look for. Overall, I aim for this project to span at least 20 species with at least 250 total samples. Another result from last summer that I found curious was the construction costs of my maple samples. Angie Patterson, a former student of my mentor, collected samples several years ago for a similar project and was kind enough to share her data with me. For most of the species we had both collected, the results were fairly close, but for both red maple and sugar maple, I was way off her mark. Red maple in particular was unusually high considering past research has shown it to be relatively inexpensive to construct. This variation has driven me to collect a lot of red maple and sugar maple in different ecosystems within Black Rock. I will compare the energy requirements of trees in low and high elevation, wet and dry soil, and other different habitats, potentially providing an explanation for the variation I found. I have new skills this summer that I plan on bringing to my collection and analysis, as well. Most notably, I will be mapping all of my samples to gather location data; this will make it easier for me to do environmental comparisons and will give more information to students who might want to do similar studies in the future. I will also build on my knowledge of the forest and my knowledge of tree identification to make my work more efficient. Expect more on these topics in future posts! The main goal of this blog is to communicate my research to a non-scientist audience. It’s easy to say, “I’m surveying construction costs of deciduous tree species at a forest site upstate,” but nobody outside of a fairly niche group of plant physiologists would have any idea what that actually entails on a day-to-day basis. But when you put it into simpler terms, a lot of research can be informative and entertaining for naïve readers. Ecology field work is a wild and crazy ride, and you don’t need to understand complex theory to read stories about it. Through this blog, I’ll document the nuts and bolts of collecting and processing leaf samples, as well as the adventures I have climbing in forklifts, getting lost in swamps, skinny dipping in reservoirs, and so on (all true events from last summer!) I will also use it to hold myself accountable to my research goals – the more I publicly document what I’m doing, the less time I waste procrastinating on the Internet. And finally, this blog serves as a medium for me to practice science writing, which I one day hope to pursue as a career. What better way to learn about writing about science than writing about your own science, right? I’m living and working at Black Rock from this week until the end of June, so expect ten to fifteen total posts from my time here. In July, I will be living in New York City while I do lab work to further process my samples; I might continue with updates during that time, but the work will be much less entertaining. That’s all for now. Keep an eye out for my first weekly recap tomorrow, and feel free to shoot me questions about anything in this initial post via email, social media, or comments.